Special thanks to our host, the ninja captain- Alex Cavanaugh. Not trying to be a sycophant or make Alex blush, but I've tried walking that mile in his shoes and all I got were blistered fingers. So, thanks! And thanks to this month's co-hosts: Hart Johnson, Chemist Ken, Candilynn Fite, Terri Rochenski, Clare Dugmore, and Lilica Blake! Years ago, when I was still working from my social work cubical, one of the ladies in my office asked me if I knew how to plant tulips. She'd bought some from Wal Mart, but didn't know how to plant them. So, I called my grandmother. She got a pretty good laugh at us young folk not knowing which side of the bulb had the roots and which side had the shoot. I told her it wasn't our fault- the package they came in didn't have any directions. "A package?" My grandma asked. "Yeah, she bought them from Wal Mart." Then she chuckled. "Why I have never bought a tulip bulb in my life. You just go get starts from another gardener." Then came the admonishment that I better not be buying bulbs...just come on over to Grandma's and she'd hook me up. She's been gone three years, but as the weather starts to warm and the sun shines longer each day...the flowers my grandmother gave me are coming to life. My garden is far more than just plants I bought from the garden center. It's a living memory. Now. What does that have to do with writing insecurity? My grandmother loved her garden and she worked in it for hours on end. I don't recall her ever planning to quit because a pest invaded or the weeds were too thick. Nor do I remember a time when she felt guilt over the hours she spent toiling in the dirt. Nope. None of that. She was a wise woman who knew the value of loving what she did. She also knew there was more than one way to grow a flower, that a person didn't need the backing of the big box store. A bulb given can net the same, if not better, results. So, for the love words, why can't writers tend to our literary gardens without the guilt, the pressure, and the need to be number one? If it brings you joy, why quit? It's good to have goals, but you must also love the process and appreciate your small blooms. Even if it's just a legacy, a little piece of heart you leave the ones you love, isn't that an accomplishment? Why do writers feel the need to reach some pinnacle for writing to be a valid endeavor? Ya know, I'm pretty certain no one ever said, "I have to be the White House gardener or I may as well quit." Need some tips on adding some more stick-it-to-it-ness? 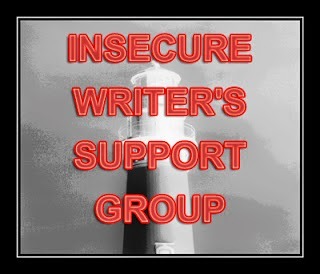 Check out the Insecure Writer's Support Group Website! It's packed full of excellent tips and, well, support! I'm glad you are well enough to be back. And thanks for linking. I think we need to appreciate all the parts of the journey, not just the arrival. You're right. It's easy to get weighted down by what we think we need to achieve to be successful. Just by putting pen to paper, or fingers to keyboard lol, and writing anything already makes us a success because we're doing what we love. I agree with you 100% Kyra! Do you know how lucky we are to have something to love? I've known people without a passion and they are really sort of sad people. Everyone needs a bliss! I think the winter may have killed my roses. I'm so sad. But it's my fault. I was so busy, I didn't properly get them ready for winter. So, my gardening skills are bad, not for lack of knowledge, but dedication. So thought provoking. I appreciate my maternal grandmother so much. she was the only grandparent I got to know and I know she loved me before she died and that means everything. You had an amazing grandmother and I love how she 'hooked you up' Liz. This was my maternal grandmother too. I had two very awesome grandmas. I was a lucky little girl. Some wise words, Elizabeth. If you aren't enjoying the journey, you're missing the point. Thanks Alex. I think those who don't love the process will fall away. Just the hope of making it is not enough. You're right. I think people can tell the difference. This is such a lovely story, and such a good reminder to all of us (and I love that your Grandmother laughed at you about this...priceless). Thank you for a great post today! Beautiful story. Spring flowers are the best. They come up just when i really need some color in my world. Spring flowers are such a happy sight! Them and the first twittering of birds. Oh, what a beautiful post! So inspiring. And touching that you have the flowers that came from your grandmother's bulbs as a living memorial to her. It is really nice. Almost everything in my yard came from some one else's yard. She was a wise woman. Wow, great analogy! So true. I've spent more money (though not as much time) on my gardens as I do on my writing, and I never expect more than a handful of people to see that work, or appreciate it. I used to count all the costs of writing and worry about it, then my husband wisely pointed out that he spends hundreds of dollars and many hours hunting and fishing...why isn't what I love to do just as important? I think being hard on ourselves is in the job description, because we all seem to do it to an extreme. Fantastic post. Such a beautiful testimony to your grandmother's character as well. Top notch my friend!! This was a beautiful post, Elizabeth. Thank you for sharing. I think that's awesome! And it could happen at any time and every curve in the road and hiccup on the way will only make the the story of how you got there even better! That was beautiful. And you have a great point, if it brings you joy, then why are we beating ourselves up over it? writers are so silly. Thank you for this post. Writers are very hard on themselves...that is for sure!! You've become very pawlific. My paws cannot pawsibly keep up. Yikes and Arf! Beautifully put, my dear human friend. The garden lives on with the flowering ideals of your beloved grandmother. Write from the heart and watch your writing flowers flourish. Thank you for stopping by my canine friend. Be sure to give Gary pawsitively the biggest hug. Ah,such wonderful words, Elizabeth! I know when I let go of all the pressure I put on myself, I feel like a better writer and I definitely enjoy my worlds more! I am soooo much better without pressure. With pressure, I just worry and fret and stare blindly at the screen. Aw, thanks. That is a quite the compliment. There seems to be a lot of stress in the writing world lately. So much pressure in the quickly changing world of publishing. I thought we could all use a reminder on the best benefit of writing. Grandmas always have the right stash. She's the go to person, all right. What an amazing post. Thanks so much for the inspiration. Grandmas sure are smart. You're absolutely right...we should do it for the joy. No matter what happens with my writing, my sons will see a mom who followed her dreams, and her heart, and will leave a lasting legacy in the form of finished books. Pretty darn cool. You are so right there. We are teaching our kids a great lesson. I have a stack of poems that my other grandmother wrote and I cherish them so much. lots of small blooms make a prettier bouquet! yay for us! You are so right! They are prettier! Glad you enjoyed those lines....some of my most unimpressive work! Oh my gosh, yes. If there are pests or weeds we don't quit. So why do we get dejected by the pesky rejections? Yep, there will be pests and weeds. Just kill and pull and keep moving on. I know. I've been reading that a lot lately. There seems to be quite a bit of frustration all around. See? They can be confusing when they have no flowers. I understand! In the 00s, I went through a phase where I wasn't writing novels. I was going through some things and I started blogging about them on MySpace. It was during MySpace's heyday and the blogging community exploded over there--after a while, I had thousands of daily readers and commenters. I wrote on there (and I still believe it) that even if I knew I'd never get a book published, I'd still write every single day because I LOVE to write. In the end...really...all that matters is that we did what we loved every single day. Touching others with our words is a huge bonus! I used to joke that I would write for chocolate. It truly is not about the money. I am like you, I just love to write. I think if the only goal is riches and fame, you'll never stick with it. It's too hard if you're heart isn't in it. This one of the best IWSG posts I've read in a long while....no kidding. Advice from the 'old folks' is like gold. I got into gardening a little over a year ago and see so many parallels to writing. There really are. Patience being one of them. People don't quit gardening when a seed doesn't flower over night. Amen, sista! Leaving a legacy was my main reason for writing books. My mom's always getting my calls ;) Funny, but my writing inspirations usually come best when I'm in my garden (specifically, pulling weeds). Anywho - you are SO right!! I wonder if the pressure, however, has to do a lot with muggles (non-writers). I know my own family would just sigh when I told them I was writing, but when my 1st pub. came out w/ a check (although very small), that suddenly flipped around and now, they're telling other ppl how proud they are. Hmmm...my garden has never fallen into this category. The garden is the best place to think. Lawn mowing for me is like a think tank. Ever notice how no one ever interrupts you while you are mowing the lawn. Fabulous job. And yeah, the checks do make people see the job differently. If you didn't already know it, Alex is featuring you on his blog today. Woohoo. I really loved this post and can relate. I just finished my first-ever rough draft. I have another unfinished one in the drawer (but that is another story) and there were times I wanted to quit this one. The expectations we place on ourselves... oh my. Why can't it be enough to do something because we love it? Why can't we read the books and blogs and articles on writing and allow them to inspire us, rather than defeating us? They are meant to make us better and hone the craft. People don't read gardening books and quit because they weren't killing the pests in the best way possible, or their gardens weren't yielding the optimum results. They read because they want those things and are willing to make changes. Yes, we should adopt the same attitude toward our writing. I love these sorts of analogies...great post! BTW, also following:) That dog in the tree is me! I saw that Alex had included me. He's truly all sorts of awesome. Yay on completing a rough draft!!! As for the one in the drawer...I have one of those too. It's a very special story that I wrote straight from my heart with zero knowledge of voice, tense, or point of view. But that manuscript saved my sanity. I was facing the imminent deaths of my dad and my brother and concentrating on writing that story kept me from dwelling in very dark places (too much). Writing is hard work. I learn something new every single day. There is so much to study and so many aspects of the art to master, but somehow we buy into this lie that if we can't master every single little bit of it on the very first try that we are hacks and should hang it up. That's just bull. And quite frankly, I think any writer that tries to knock a newbie or a wannabe out of the saddle is showing their own insecurities. There is a difference between arrogance and confidence. A confident writer knows their stuff and they happily help those around them. An arrogant writer thinks they've cornered a market by luck and they want to kick all the other writers in the teeth to oust the competition. Keep reading, keep growing, and never ever let someone tell you you're wasting your time. If it makes your heart happy, it's all good. I love this post! Love it! It brought tears to my eyes, made me smile, and brought back memories of my own Grandma. Wise women can teach us so many lessons. And gardening is definitely something that requires love, hard work, and every day care. I love the lesson you found - we don't all need to be White House Gardeners, or authors. We can write and garden, and love what we do. Right on! Words are free and if they bring us joy, we should just run with it. We truly are the lucky ones. I've met people who have no idea what their bliss is and they are kind of sad. Or imagine if our love was shopping? At least writing is cheap! What a beautiful, uplifting post! I have green thumbs, but my mom and grandmother had both green fingers and thumbs. This made me smile-it is so nice to meet you! Nice to meet you too! I do well in my garden until football season rolls around and school starts and life gets crazy. I was holding my breath for my roses this year. I usually bury them for the winter months, but got busy and didn't do it. Thought for sure they'd be dead, but they are starting to green up. Yay!!! 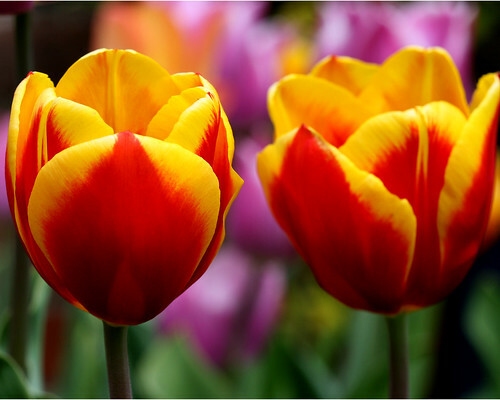 Tulips always remind me of my own grandmother, who could grow pretty much anything. She once took the ivy from a friend's wedding cake and got it to root, and up until the time of her death, every friend and family member received part of that ivy for their own homes. Her gardens were full of tulips and snapdragons and all kinds of good things. That is the sweetest! How did these amazing ladies do it? My grandmother could do starts and save dying plants. I suppose the biggest secret is patients and devotion. Great minds thinking alike once again! Great post Elizabeth. The accomplishment of writing a book is so uplifting, it should make you bloom. Writing the words is the growth. If I grow each time with the words then that's an achievement in itself. The planting of the tulip bulbs made me laugh. It reminded me of the time hubby said he'd plant some bulbs, and I could see them above the ground from the kitchen window when he'd finished. He had only covered the tiny hairs on the base of the bulbs with soil. I had to plant them later, because I didn't like to tell him that the bulbs were supposed to be in the ground. How sweet of him to try! My hubs planted flowers for me one year and used do much fertilizer the soil was too rich for years and everything died. But he tried. Love this post. I'm not even sure which part to comment on first. It's all so perfect. So I'll just say... thanks for the inspiration! I totally agree!!! Leigh, you always make me so happy. Love you lady! Actually, I've always wanted to be a White House gardener, but I was disqualified because of my inability to grow a grass skirt. Poor Mark! Those standards can be so high! Hmm...where do they get the grass for the skirts? That's some long grass! What a great post, Elizabeth! Your grandma sounds like she was an awesome person, and a great role model! Then my work here is done! I will lock up on my way out...just joking. This is a great analogy for toiling with our writing. We should remember the initial enjoyment as well as the rewards it may or may not reap. As always, it's about the journey rather than the destination. Yep, the journey is really the best part, if you remember to appreciate it.